PNEUMATIC CONVEYING COMPONENTS & SYSTEMS • BULK BAG LOADING & UNLOADING SYSTEMS • BAG DUMP STATIONS FLEXIBLE SCREW CONVEYORS • AERO-MECHANICAL CONVEYORS • MULTI-INGREDIENT HANDLING SYSTEMS • BIN ACTIVATORS BATCH WEIGHING & SCALING SYSTEMS • UL-CONTROL PACKAGES • MOBILE VACUUM CONVEYING SYSTEMS • FILTER RECEIVERS BAG DUMP STATIONS WITH INTEGRATED BAG COMPACTORS & DUST COLLECTION • MINI-HOPPER VACUUM CONVEYORS SANITARY VACUUM CONVEYING SYSTEMS • INDUSTRIAL VACUUM CLEANING SYSTEMS • COMBUSTIBLE DUST VACUUMS VAC-U-MAX • 69 WILLIAM STREET • BELLEVILLE, NJ USA 07109 www.vac-u-max.com •info@vac-u-max.com • (973) 759-4600 • (800) VAC-U-MAX Have an application? 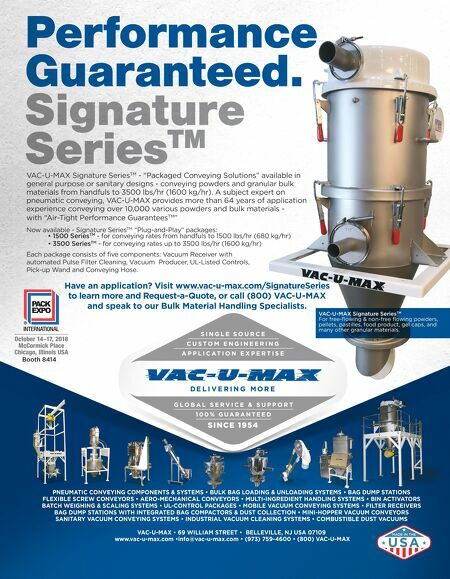 Visit www.vac-u-max.com/SignatureSeries to learn more and Request-a-Quote, or call (800) VAC-U-MAX and speak to our Bulk Material Handling Specialists. 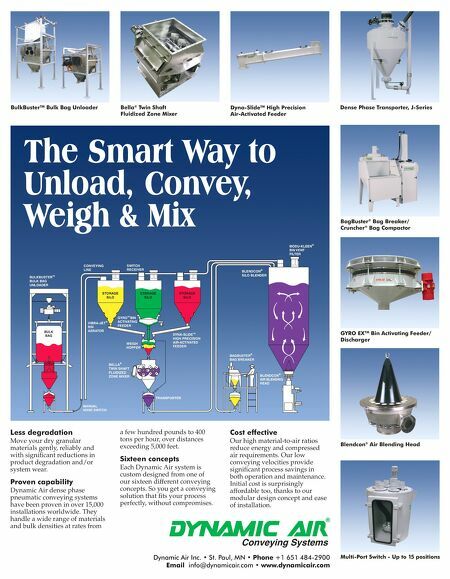 VAC-U-MAX Signature Series TM - "Packaged Conveying Solutions" available in general purpose or sanitary designs - conveying powders and granular bulk materials from handfuls to 3500 lbs/hr (1600 kg/hr). A subject expert on pneumatic conveying, VAC-U-MAX provides more than 64 years of application experience conveying over 10,000 various powders and bulk materials - with "Air-Tight Performance Guarantees TM " Now available - Signature Series TM "Plug-and-Play" packages: • 1500 Series TM - for conveying rates from handfuls to 1500 lbs/hr (680 kg/hr) • 3500 Series TM - for conveying rates up to 3500 lbs/hr (1600 kg/hr) Each package consists of five components: Vacuum Receiver with automated Pulse Filter Cleaning, Vacuum Producer, UL-Listed Controls, Pick-up Wand and Conveying Hose. Booth 8414 VAC-U-MAX Signature Series TM For free-flowing & non-free flowing powders, pellets, pastilles, food product, gel caps, and many other granular materials.